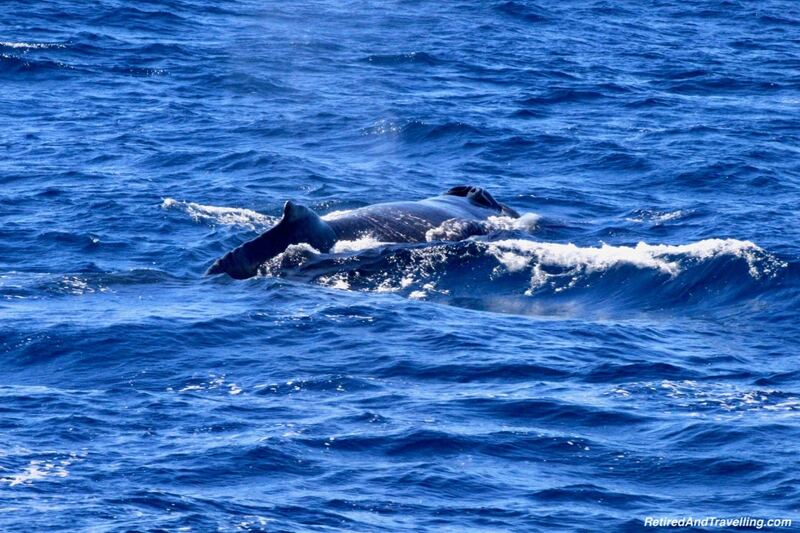 It was the peak of whale watching season when we visited the Azores. 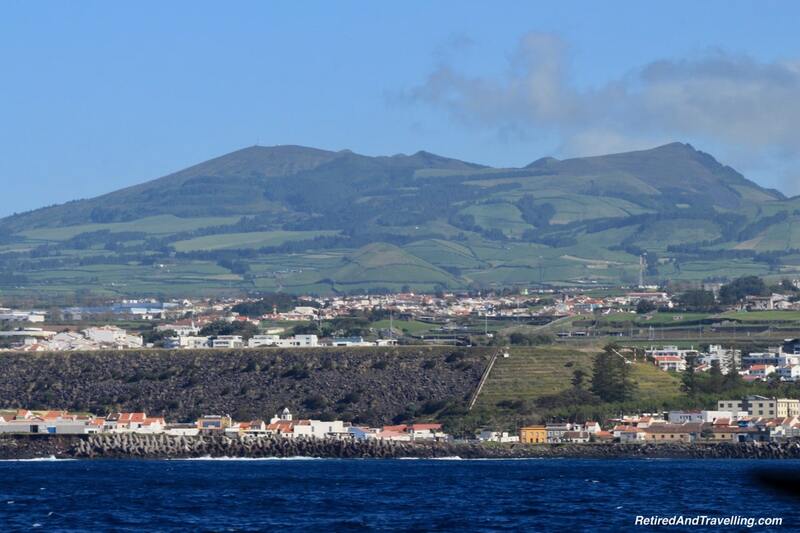 We debated whether to go whale watching from Sao Miguel at the beginning of our visit or wait until we visited Faial later in the trip. 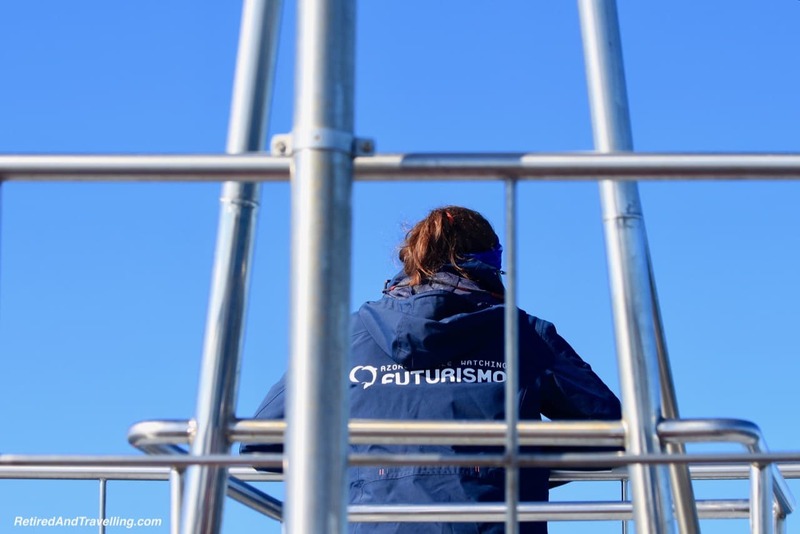 To maximize our chance to see whales, we decided to try on Sao Miguel first and see how things went. We booked a whale watching tour for our first free day. It rained on the original day but the weather held for a second chance to go whale watching from Sao Miguel. 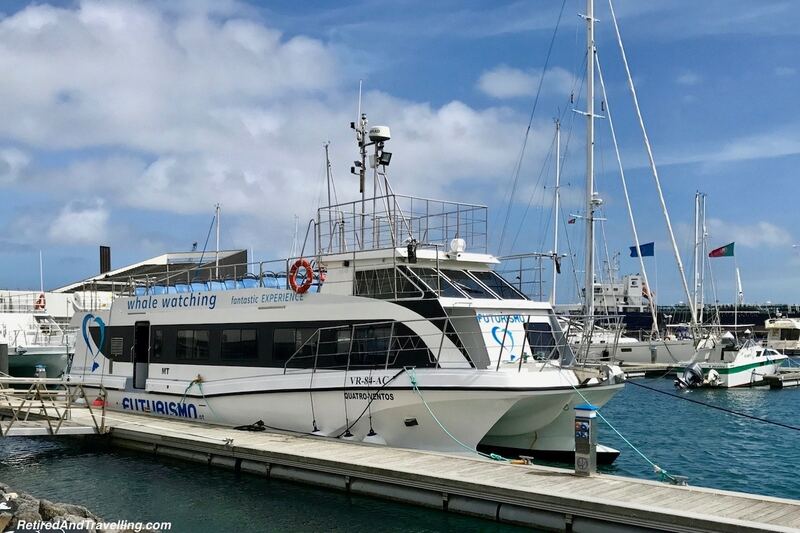 There were several companies the provided whale watching from Sao Miguel. We saw the boats leaving the harbour from our balcony. We booked with Futurismo on the recommendation of the tour guide we used to tour Sao Miguel for 3 days. There was a choice to boat offered. The small rubber boats were faster but you spent the whole time out in the weather as the boat bounced. We chose to go out in the larger catamaran boat. This offered some cover and a bit of comfort if the boat transit time was long. We got a good briefing at the shop before we boarded the boat. 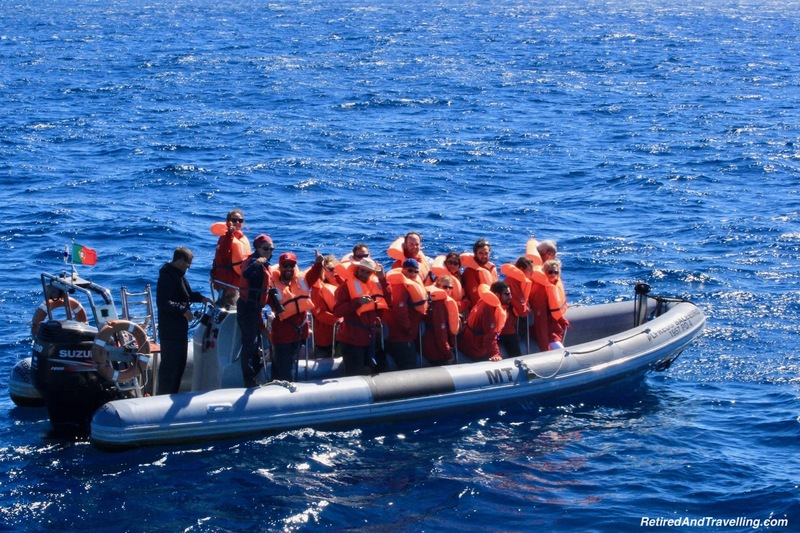 The briefing covered both safety issues on the boat as well as information about the sea life we would see on our trip. 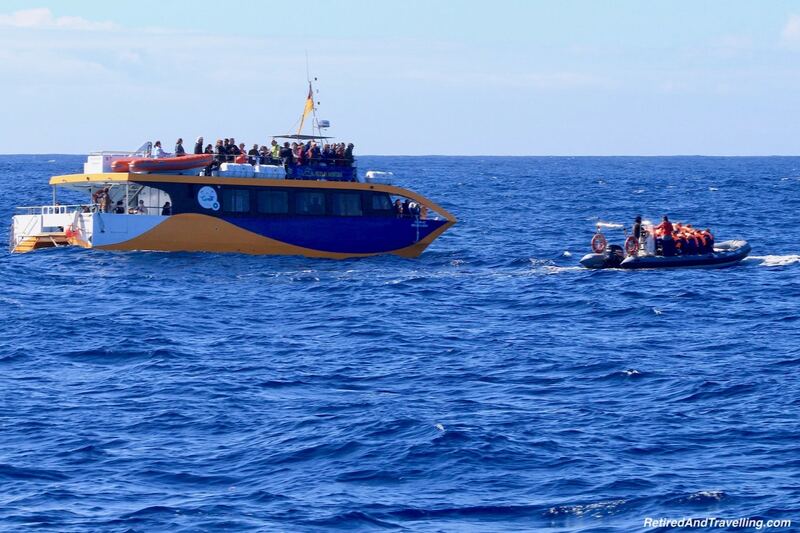 Several days of bad weather had backed up the whale watching from Sao Miguel. 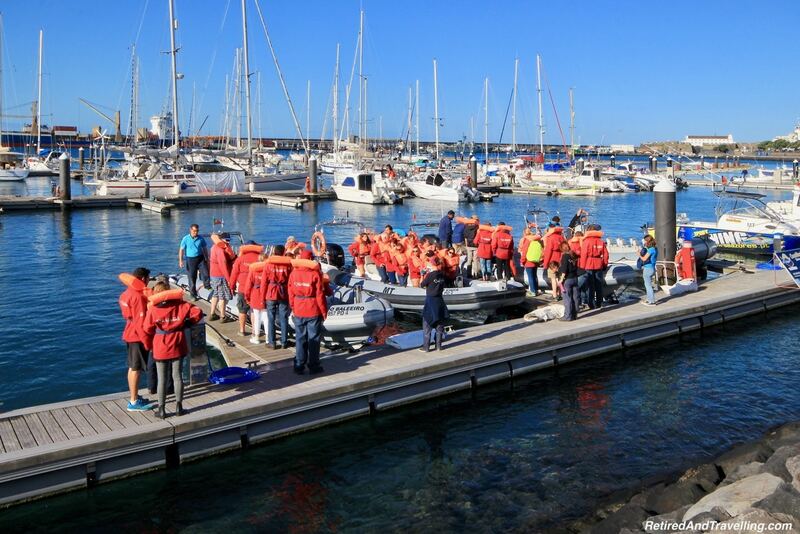 As a result, the whale watching boats were all packed. 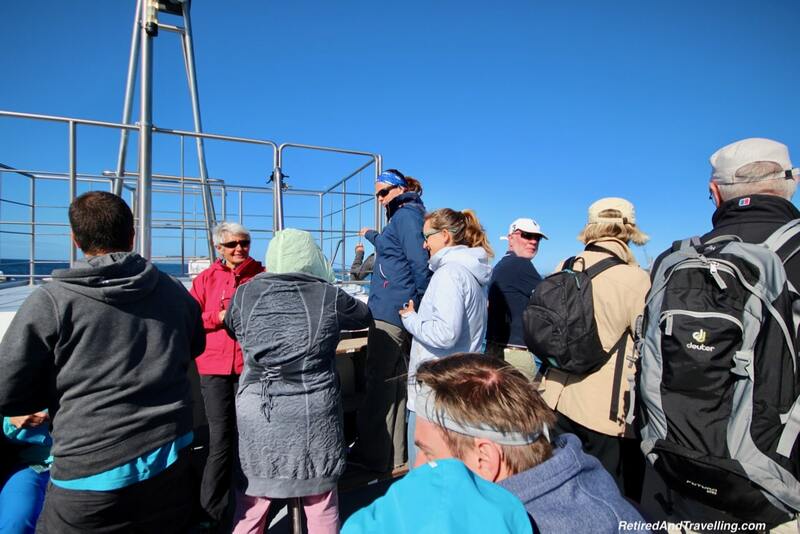 While our catamaran had lots of space on two decks, virtually everyone was crowded on the upper deck. We just hoped that people never all went to one side! 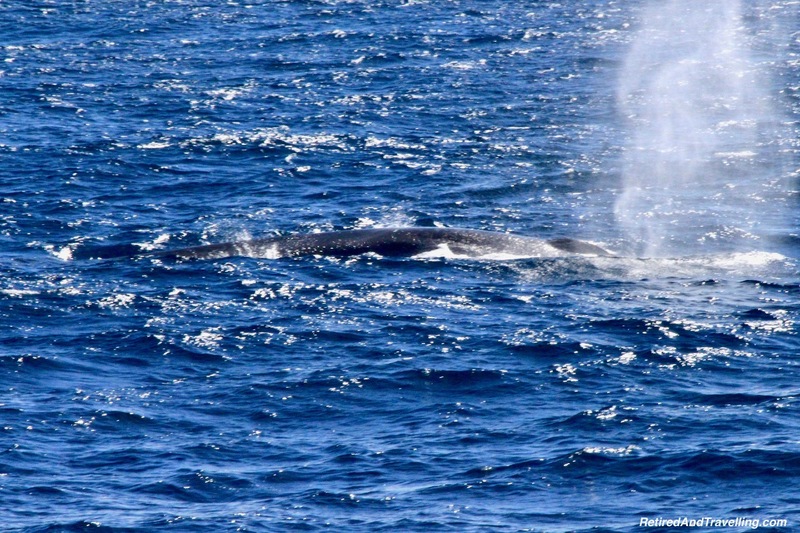 In the Azores, most of the whale spotting is done from the shore. 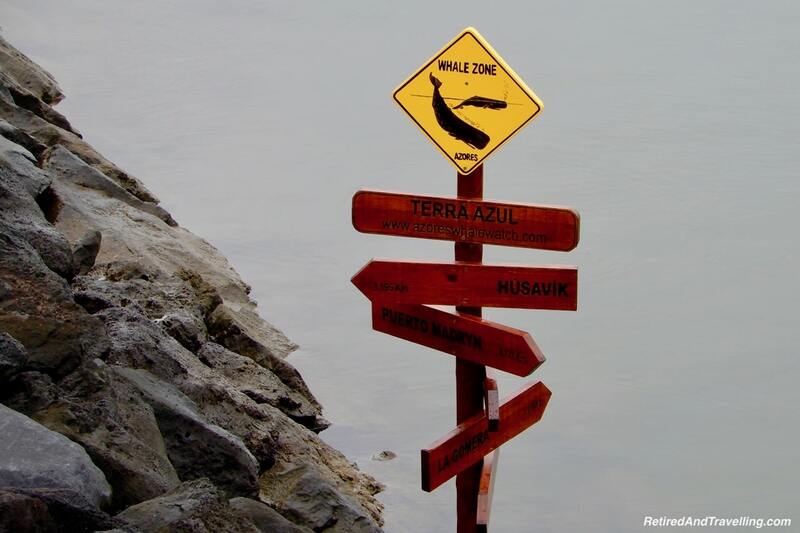 As we toured the island, we often came across signs for whale sighting locations. Whale watching stations are set out around the island. 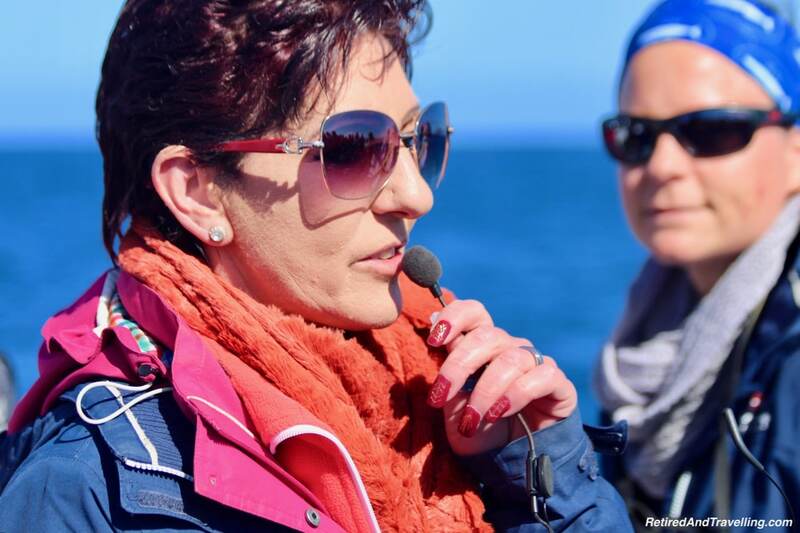 The boats get directions from these land stations on whale sightings. When the captain gunned the engine, we knew he was off to the where the whales had last been seen. The staff provided running commentary in 3 different languages (English, Portuguese and German). 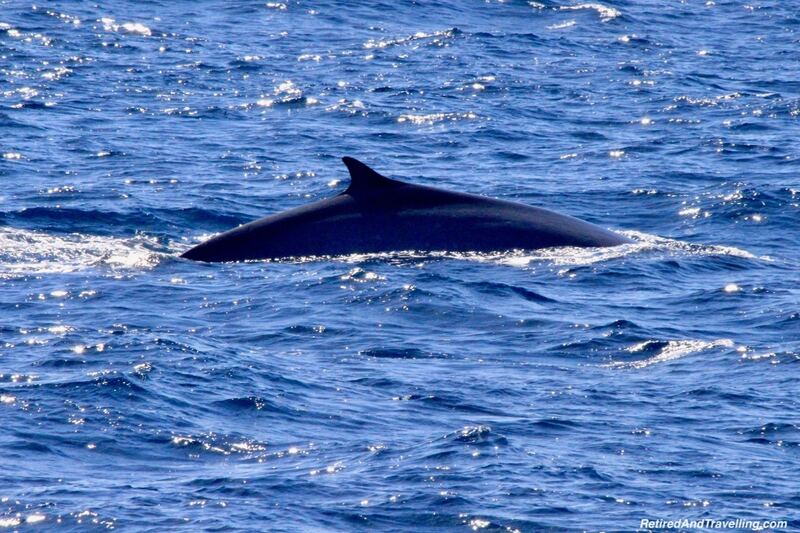 We got great general information about whale watching from Sao Miguel. And more specific commentary when wildlife was spotted. They did a good job of spotting the whales once we got to a sighting area and getting people properly focused on the right spot. The boat was moved several times. When we changed position, all of the other boats out that day also moved. The small rubber boats got to the new posts faster and were closer to the water. So they often got a much better first view of the whales. 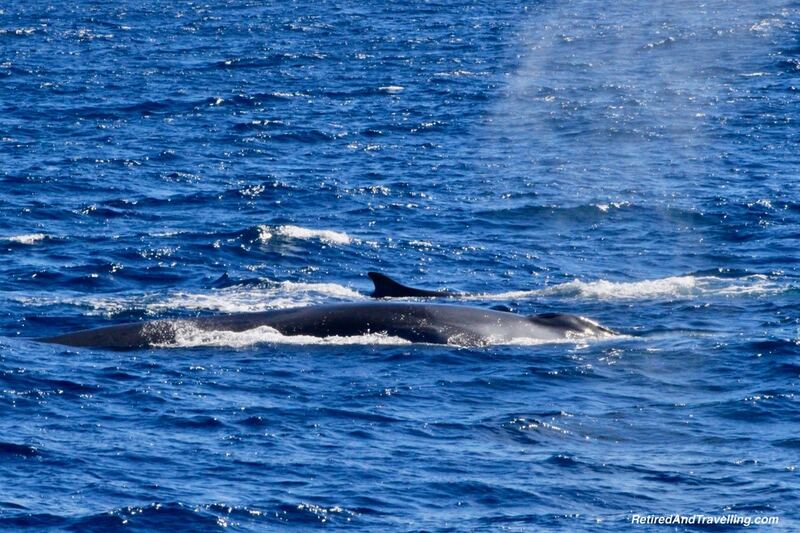 The first whales we spotted were Fin Whales. They had a distinctive fin on the back that looked very much like a shark tooth. The first sight we got was blow holes that helped to zero in on the actual location of the whale. We then got to see the fin surface. 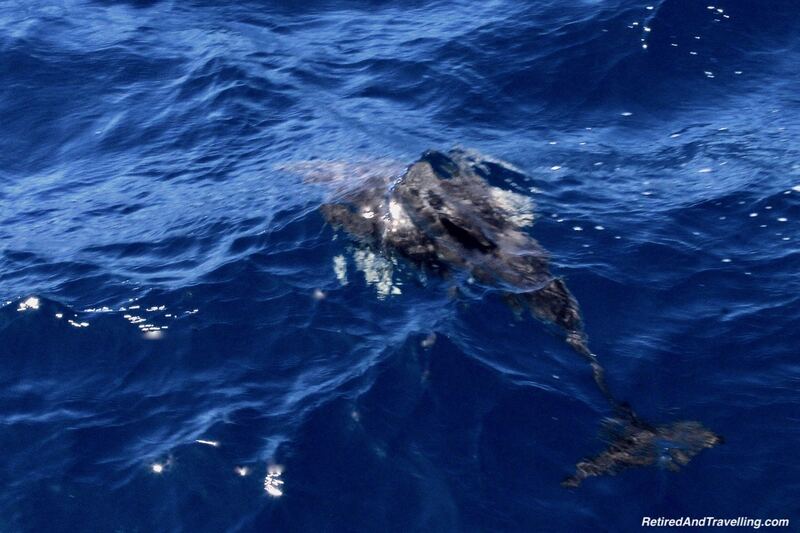 And once we saw a baby whale with its mother. The second type of whales we saw that day were humpback whales. We saw humpback whales in Monterey, California and also on a whale watching trip in Vancouver, BC. We even saw humpback whales on our Alaska cruise! But it was still exciting to see the hump surface. 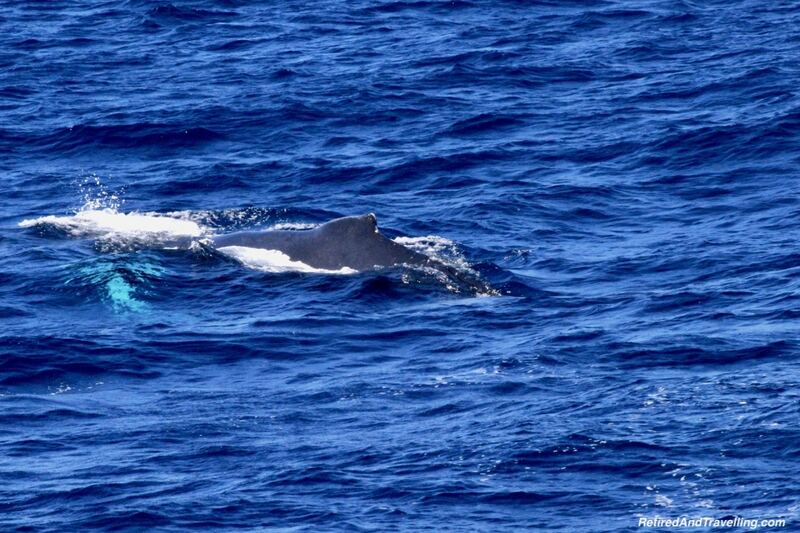 The humpback whales had very distinctive white patches. When the whales got ready to dive, we got a little tail wag. 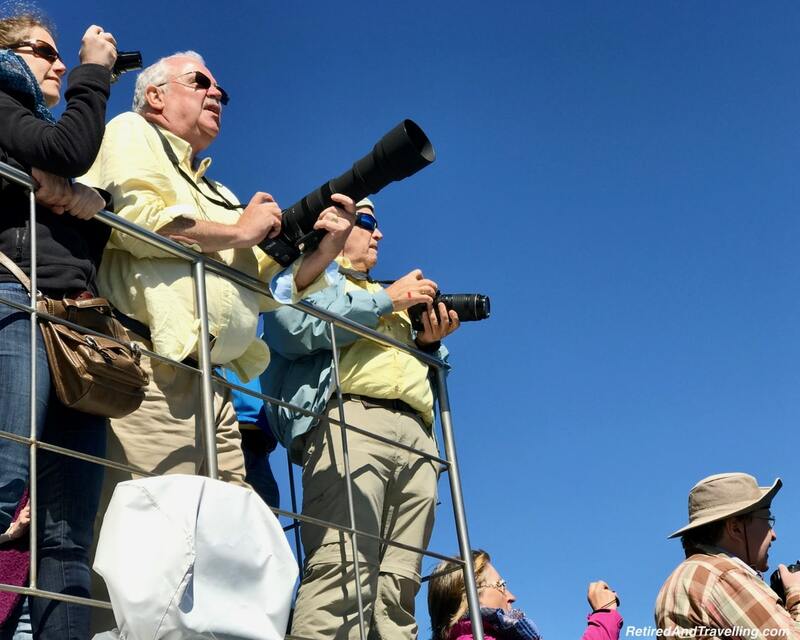 Whenever whales were sighted, people pushed to get up to the small observation deck. People leaned out with their large zoom lenses trying to capture than National Geographic moment. To my continued disappointment, on this trip we never saw a whale breach. 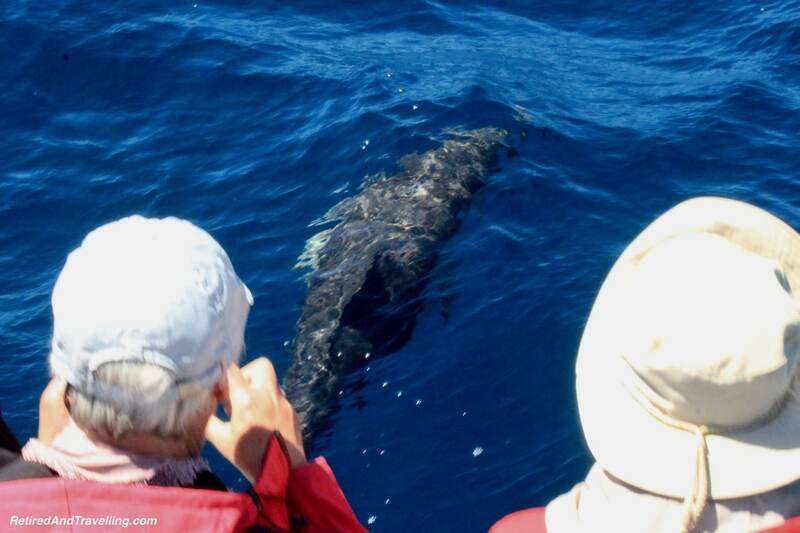 We have seen humps and tails but that elusive breach keeps us booking whale watching. 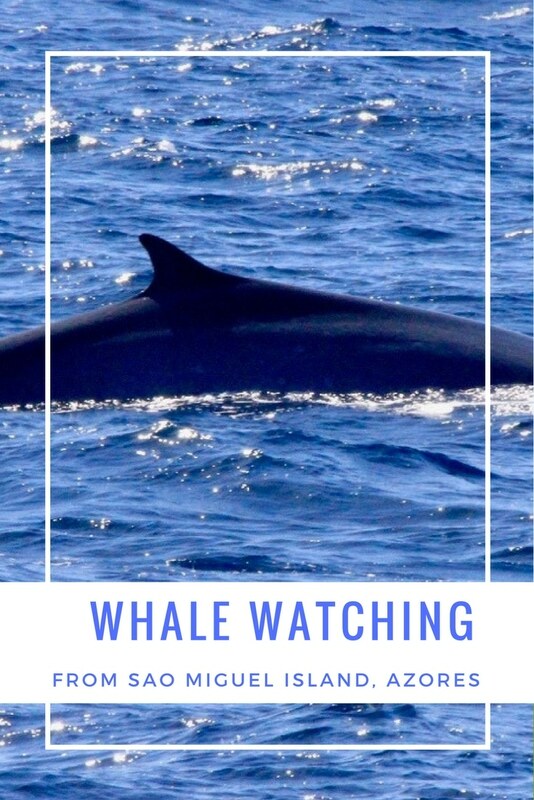 It was exciting whale watching from Sao Miguel when we finally caught up to the whales! After the grey days with stormy waters, it was great to be out on the water. Several times the boat went in search of large pods of dolphins. When we spotted large groups of sea birds, there was generally dolphins in the area. The people on the front bow at the water level may have actually seen a dolphin, but all I saw was a blur. 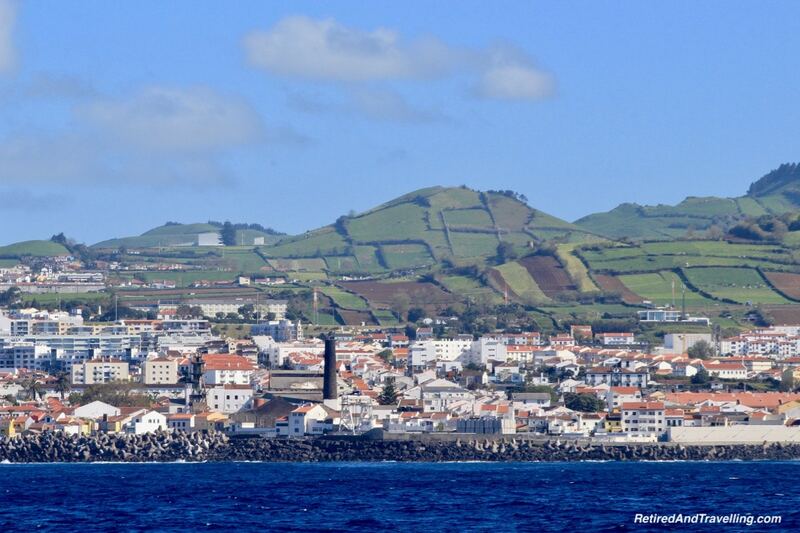 As the boat went along the north shore of Sao Miguel, we got a view of Ponta Delgado and some of the places we had already visited on our trip along the coast. The mountains formed the silhouette of the island and provided the awesome volcanic calderas we explored on Sao Miguel. Whale watching from Sao Miguel had been an ok experience. It was still not the “wow” moment had looked for. 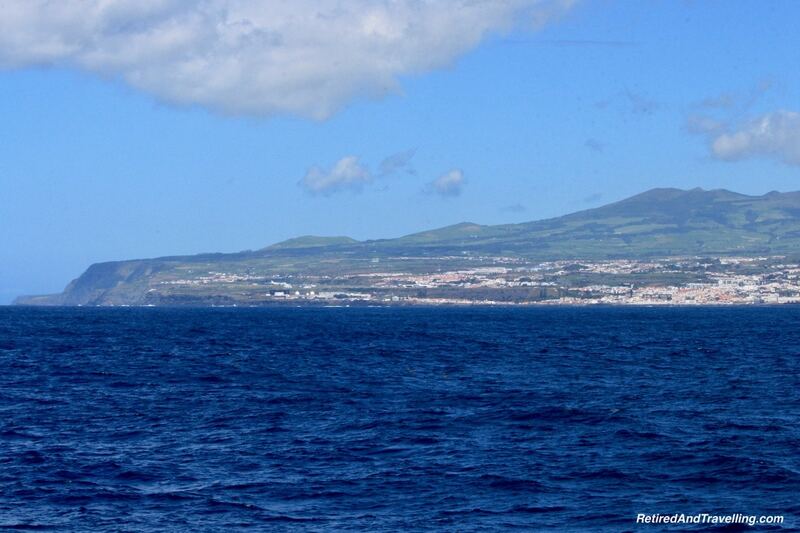 We had a second chance to go whale watching when we went to Faial Island. We also saw the large whale watching operations on Pico Island. 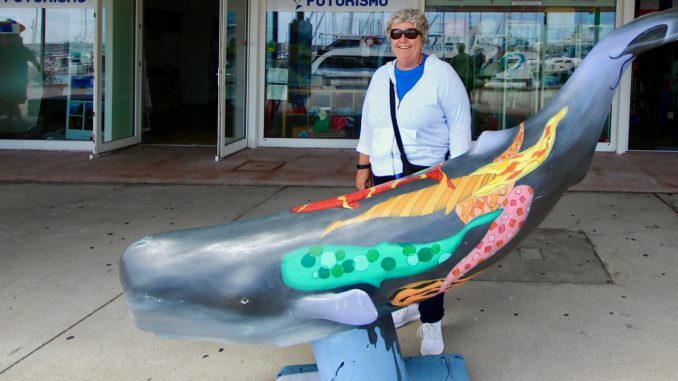 If we booked whale watching again, we would also book the smaller boat. It would get us closer to the action. 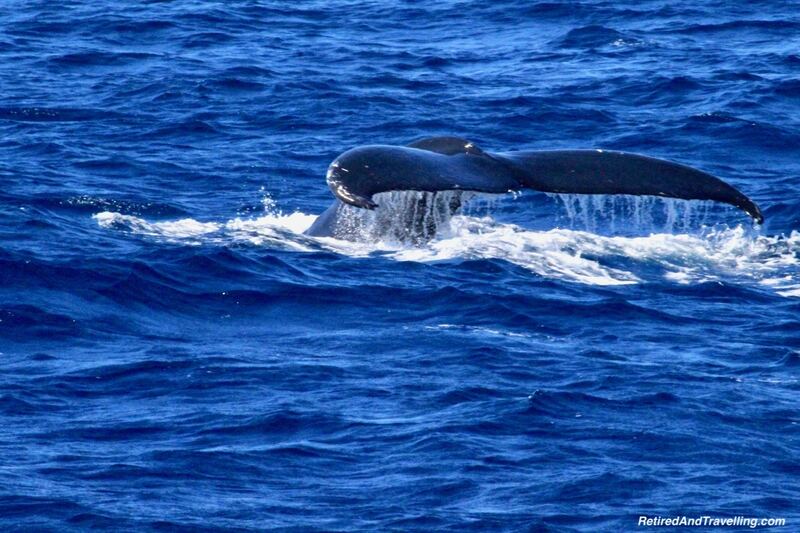 We hoped that we might get another chance for a great whale show before we left the Azores! 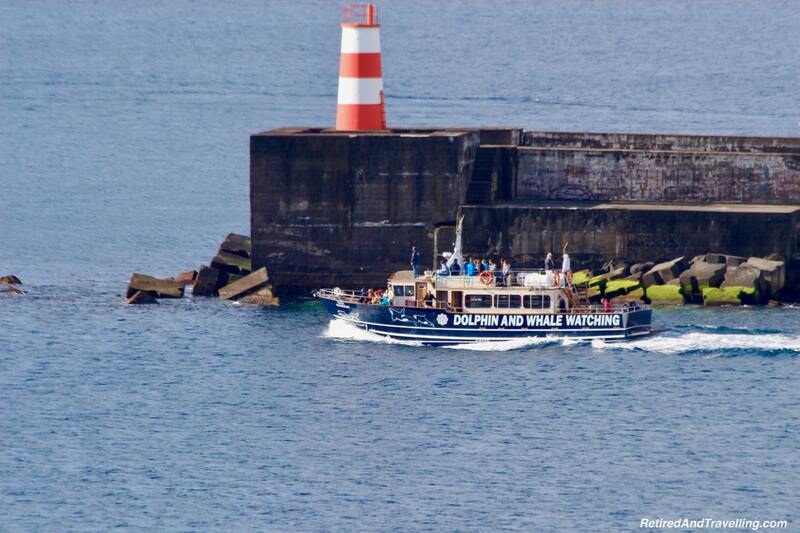 Have you gone whale watching from Sao Miguel in the Azores? Or would you recommend somewhere else to try whale watching?